A Foundation for Food and Agriculture Research grant will fund a study including Iowa State University to examine possible impacts on pollinators from strips of prairie planted in crop fields. Lisa Schulte Moore, a professor in the Department of Natural Resource Ecology and Management, is leading the interdisciplinary team from Iowa State and the University of Illinois at Urbana-Champaign to investigate whether embedding strips of prairie in crop fields affects honeybee health, native pollinator abundance and diversity. Researchers will study bee and monarch butterfly populations. "The work will result in best management practices for farmers to support pollinator conservation, honeybee colony survival and crop productivity using integrated pest management approaches," said Schulte Moore. The other researchers on the team include: Steve Bradbury, professor of entomology and natural resource ecology and management; Matt O'Neal, associate professor of entomology; Amy Toth, associate professor of ecology, evolution and organismal biology; John Tyndall, associate professor of natural resource ecology and management; and Adam Dolezal, assistant professor of entomology at the University of Illinois. The Foundation for Food and Agriculture Research (FFAR) is providing a grant of $503,028 for the study, and requires matching funds, which are being provided by Iowa State, the University of Illinois, Bayer Crop Science, DuPont Pioneer, Syngenta and the Iowa State University Foundation. 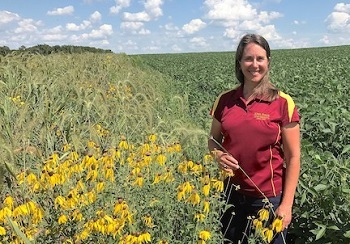 "Managed and native pollinators are vital to many crop production systems and the ecological resources that support them," said Sally Rockey, executive director of FFAR. The foundation, a nonprofit established through congressional support in the 2014 Farm Bill, today announced 16 grants totaling $7 million for research to address declining pollinator health, an ongoing threat to agricultural productivity in the United States. More information about the grants awarded through the FFAR Pollinator Health Fund: http://foundationfar.org/2018/03/13/7-million-to-pollinator-health. Schulte Moore also co-leads the Science-based Trials of Rowcrops Integrated with Prairie Strips (STRIPS) project, which has documented many benefits from placing strips of perennial vegetation strategically in crop fields. Besides reducing soil erosion and nutrients runoff from the fields, it has increased numbers and diversity of insects, including pollinators. FFAR established its Pollinator Health Fund in response to the agricultural threat posed by declining pollinator health. Insect pollinators contribute an estimated R24 billion to the United States economy annually.